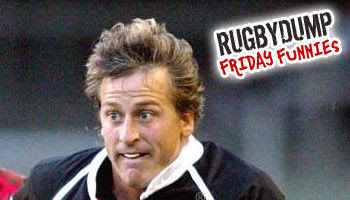 This week's Friday Funny comes from the Super 12 a few years back. Deon Kayser gets the better of former team mate Robbie Fleck after Fleckie broke through the line and was away for the try. Fleck casually strolls in, not realising that the rapid Kayser is right behind him. Kayser effected the tackle brilliantly, knocking the ball out of Flecks hands and causing him to nose dive into the turf, causing some people to coin the phrase, 'The Fleck Flack'. Great chase by Kayser who always gave his best when playing for EP, the Sharks and the Boks. The lesson from this one - this is rugby and you have to put the ball down to score, as Fleck will keep telling himself when he wakes up with cold sweats thinking about this night after night. lol! same thing happend in a match i played in a few weeks ago- the player was walking in to take the piss and didnt see my m8 comming from the side. Whatever happened to "Man on you!...Man you!"? lol @ Fleck. Look at the size of Butch tho, he looks massive for a 10.
i was at the match, i thought the sharks fan sitting next to me summed it up pretty well when he screamed "DIS... VOKKEN... UITSTEKEND"
saw this before in a Try Saver / Rib Breakers collection.. thanks for post as a stand-alone. Any chance you can get the old Norm Berryman in-goal gaffe? He sticks his tongue out and drops the ball. Kind of a metaphor for the NZ vs France at RWC 2007. It's from a few years back, but he was kitted for Canterbury in either NPC or S12.. I remember watching this with my dad a couple of years ago. We both just about pissed ourselves laughing! !